Today’s photo of the week is of Hokitika rangers Lyndon Slater and Faye Gordon releasing juvenile whio/blue ducks onto the Styx River on the West Coast. 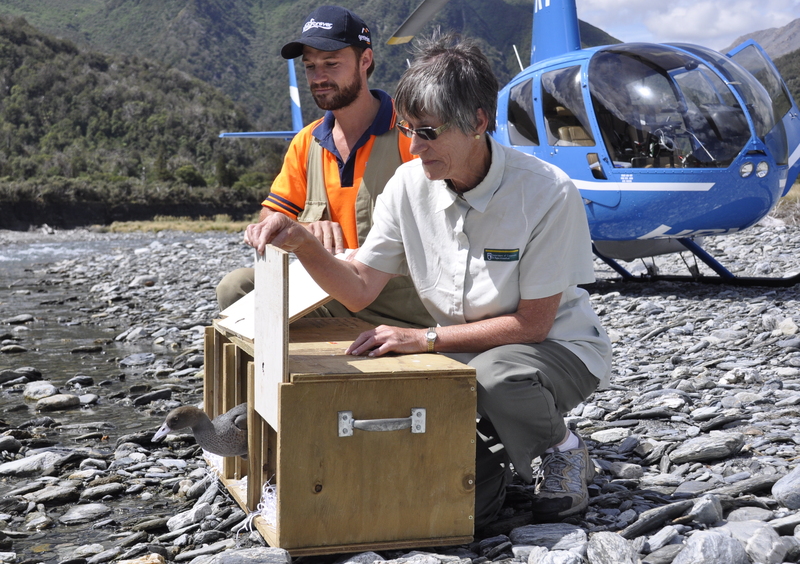 It’s been a bumper whio/blue duck breeding season and West Coast rivers in particular have seen over 25 juvenile ducks released over the last couple of weeks. More than 70 ducks are being released into the wild around New Zealand this season, and increased numbers of wild bred birds have been reported on rivers throughout the country. The juvenile ducks are being returned to rivers once they are less vulnerable to stoats and other predators. It would be great if photos were credited – this was photo was taken by myself, Sabrina Luecht. Thank you. Our sincere apologies Sabrina, we have fixed that up. Thanks for capturing such an amazing photo from this whio release.